The Government has announced its final decision on new rates for the Feed-in Tariff (FiT) for 2016 and beyond, including a 64% cut to the domestic solar tariff. Domestic installations up to 10kW in size will now receive 4.39p/kWh – down from 12p/kWh currently, but much less punitive than the original 1.63p/kWh proposed in the Government's consultation. Small commercial projects of 10-50kW in size will see feed-in tariff rates reduced from 11.30p/kWh to 4.59p/kWh - again a big drop, but lighter than the original 3.69p/kWh proposed in the consultation. Meanwhile, larger rooftop and ground-mount projects above 1MW in size will receive just 0.87p/kWh - 15.5% less than the consultation's proposed rate of 1.03p/kWh. 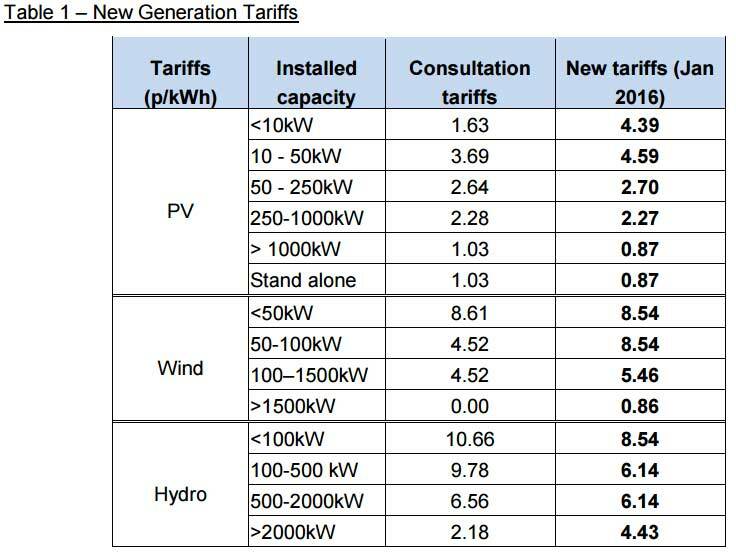 All of these feed-in tariff changes will come into force from 8 February, with the deadline for projects to receive the current higher tariffs set at 15 January. The overall spending cap for all technologies (wind, solar, hydro and anaerobic digestion) will stay, as proposed by Government, at £100m until 2018 – approximately £35 million per year. The STA said the new tariff rates will be 'challenging' for commercial sector investment but hopes that increasing corporate commitment to acting on climate change will help to drive the market forward. It said that returns may still be sufficient for investors with particularly low hurdle rate to investment, such as crowd-funders, local authorities and pension funds. In its Impact Assessment released alongside the decision, the Government predicted that between 9,700 and 18,700 solar jobs could be lost as a result of the changes. Despite the dramatic reduction, the cuts are still significantly lower than the 89% mooted by the Government in its consultation document, published back in August. The consultation was met with outrage by the solar industry and green groups and saw more than 55,000 responses submitted. “Government has partially listened,” said Solar Trade Association (STA) CEO Paul Barwell. As well as the tariff rates, the STA said it was “very concerned” by the proposed cost-control mechanism which will see the Government put maximum caps on the total amount of solar it wants to see installed in every quarter. The STA said this could be very damaging to developers, but added: “They do appear to have taken on board requests for unused capacity to be recycled from one quarter to another and a queuing system for projects that don’t get in on time”. The decision also saw pre-accreditation re-introduced for all solar installations larger 50kW in size – roughly the size of a school – which will give businesses and other bigger rooftops more certainty when investing in solar. However, rooftop and ground-mount projects above 1MW will receive just 0.87p/kWh. The Government has also not increased energy efficiency requirements to be eligible for the solar feed-in tariff, and has not made any changes to how the tariffs are indexed over time or to the export tariff when electricity is sold back to the grid. However environmental campaigners were less optimistic about the consultation decision, with Friends of the Earth describing it as “a hammer blow for households, jobs and UK plans for tackling climate change”. FoE renewable energy campaigner Alasdair Cameron said: “Massive public opposition to the government’s original proposal may have forced ministers to modify their plans, but this is still terrible news for the UK and its small-scale renewables industry. “It’s outrageous that the government continues to hand out billions of pounds in subsidies every year to climate-wrecking fossil fuels, while trying to block the clean energy sources we urgently need to power our homes, hospitals and schools. FoE said an acceptable FiT rate would be between 7.92p/kWh-9.11p/kWh for domestic solar and 4.43p/kWh – 6.06p/kWh for larger commercial rooftop solar.